Until 1869 most taverns and public houses brewed their own ales. That year, however, parliament passed the Beerhouse Act, which allowed people without a brewing licence to sell beer. This led to a large increase in the number of public houses across Britain, with the bulk of these pubs selling ales supplied by large brewers. 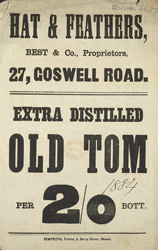 The Hat and Feathers pub in Goswell Road here advertises selling ‘Old Tom’: a sweet gin popular in the late 19th century.